I'm going to introduce you to the string stops, now. They are the only kind of stops left with 8s and 4s on them. Eights and fours are important, remember, because you will be playing the notes you've asked for (the 8s) and an octave higher (the 4s). The remaining stops have things like fractions and roman numerals on them, and for now I've chosen to avoid these. If you'd rather be safe than sorry, you'll find you can't get into very much trouble as long as you don't use these at first. But in a couple of installments, we'll learn about these, too, because these are your more colorful and interesting stops. There are also some whole numbers that we've left out--16 and 2. These are the lowest octave, and the highest octave. We'll leave these aside for the moment, too. String stops are among your softest stops, and they sound vaguely like stringed instruments. They have names that often contain the word "viol" in them, which is your giveaway, or, interestingly, the word "celeste," which in the orchestra is a bell-sounding keyboard instrument that Tchaikovsky likes to use every December to dance in the sugar plum fairies. On the organ it is a sweet-sounding string stop. Dulciana (from dulce, or sweet) is also a string stop. So is unda maris. Since there is a little more variety among string stop names you may just have to try them to find out which ones on your organ are string stops. They will have whole numbers on the stop tabs, and they won't be flutes (ie., with names like "somethingflote" or foundations--"principle" or "octave"), so by process of elimination you can make a pretty good guess already. At Faith, our very symmetrically designed organ has two of these on each manual as well. 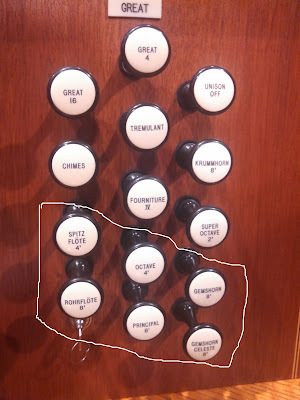 Our very symmetrically designed organ is also configured so that the "friendly" stops I've introduced so far are all at the bottom of the stop jamb. The more adventurous ones are all at the top. If you use any of the bottom six in combination you can't get into too much trouble. I'll explain why later on. We've been treating each "division" of the organ separately, but now I want to introduce you to a way to combine them. This is the first thing that could invite trouble, but I am doing it so that you can prevent having an accident it by knowing how it works. Let's start with that general cancel button I taught you to love. Now deploy a flute stop on the upper manual. Press the "swell to great 8" tab. Now play something on the upper manual. Play it again on the lower manual. The sound should be identical. Now add a stop to the lower manual. Let's make it a string stop. Play something. You should now be listening to both the string stop on the lower manual, and the flute stop from the upper manual together. Pretty cool, no? You can now review everything from our first installment--using the flute stops, the principle stops, and now the string stops, separately and in combination--but this time you aren't limited to the stops on a single manual. You could, say, use the two stops available on the lower manual (assuming your organ has the same number as ours) but this time you can combine them with both of the flute stops on the upper manual, by using the "swell to great" coupler, which adds the two flute stops you've deployed on the upper manual (the swell) to the lower manual (the great). Now by playing the lower manual you are hearing all four flute stops at once. The sound may be richer, fuller--and possibly more out-of-tune (one of the hazards of pipe organs and weather changes)! Now that you know something about the couplers we can create a routine for the start of every organ piece. There is nothing worse than starting to play and getting an entirely different sound out of the organ than one you expected (especially if it is five times as loud). Much the same way as you check your mirrors before pulling your car out of the driveway, I want you to scan the console before you start to play each time. It will take some time at first but soon you will be able to do it in under five seconds. First check for the blue lights that indicate the crescendo pedal might be on. No blue lights? Good. We won't be using this feature for a while. Then check the couplers. Are they off unless you intend them to be on? Now just like we learned to cross the street (in America, anyway) look left to right. The knobs on the far left are usually the pedal. I haven't talked about that yet because I am assuming you aren't using them. Make sure none of those stops are on. Then check your SWELL--the upper keyboard is generally on your left also. Make sure you've got the stops on that you want. Then look to the right and check the stops on the GREAT. Are we good to go? Then go! Remember: Crescendo, couplers, pedal, swell, great. Then play. It may take you some time to master this, but, I urge to you keep at it. If you do this every time you play something--scan the entire console--and if you choose your registration deliberately before the start of each piece--you'll get a lot of practice in a short time and not only will you know what you are doing, your fear of the organ console will go away! Now you know enough about the organ to sound like a competent organist. Your playing will still be bland--we've still got about half the organ to discuss! But already you know about all the basic features. And though I've tried to limit the information, any amount of information at first may seem like too much, but you can certainly go back and read these two blogs again (and again) and expect that, if you are playing regular church services, it will probably take a few weeks to gain comfort over all the stuff on that console. But keep at it! It is certainly worth the time to learn, and with knowledge will come an increase in confidence. And you are already setting the seeds to sound like a "real organist" in a relatively short time rather than a pianist who sets some inoffensive stops and leaves them on the whole service. There is nothing that more obviously says "I'm not a real organist" than somebody who uses the same organ sound the entire time. Learning to use the pedals will take longer, but using creative organ registration can come more quickly. And it will make you sound like an organist! And feel like one, too.